Amazon’s new entry to tablet market is sure tempt to consumers with its 60% cheaper price than an iPad. A simplified device than the iPad 2, while saving on some of the tablet’s features that differentiates the Kindle Fire rather than trying to compete in a market that’s already owned by Apple. The Kindle Fire tablet has a 7-inch screen, which is smaller and 50% lighter than the iPad 2. And it’s convenient to hold in one hand. The Kindle Fire has new browser called Amazon silk, but doesn’t have a camera, SD card memory expansion, no HDMI out and microphone, so voice recording and chat are out. Wi-Fi features only (while iPad comes in 3G models), that means users can surf the Web and download content, only when they have a connection. The Kindle Fire offers eight hours of battery life, as opposed to 10 hours for the iPad 2. 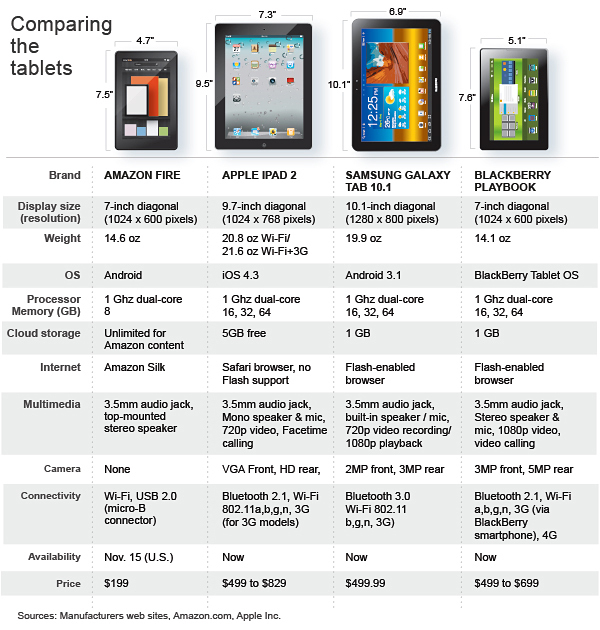 The Kindle Fire has only 8GB of storage, while 16GB as the largest option for iPad 2. But Amazon offers free cloud storage on its vast bank of servers. So, Kindle Fire users will have access to streaming movies, e-books and music. The Kindle Fire apps will have access to more than 250,000 apps in the online Android Market using modified version of Google’s Android operating system. Of course, iPad has wider access to more than 425,000 apps in the Apple Store. With its own tablet, Amazon has the advantage because the company has amassed a mountain of digital products and services that could be sold through such a device. Similarly, Apple discounted any serious hit because it also has rich library of content. Other rivals such as Samsung, without their base content or services to support their devices, are most exposed. Amazon expects shipments to start on November 15 — hitting store shelves at Best Buy and other chains just in time for the peak holiday shopping season in the US. I think this new tablet is a sure hit to Filipinos. And ideal for people with less concern with brand as long as it serves it purpose. Can’t wait to have here in Saudi Arabia. I also like the size, very handy. I think the only problem of this gadget for Filipinos is the shipment cost, tax and duties that needs to be paid by the buyer.